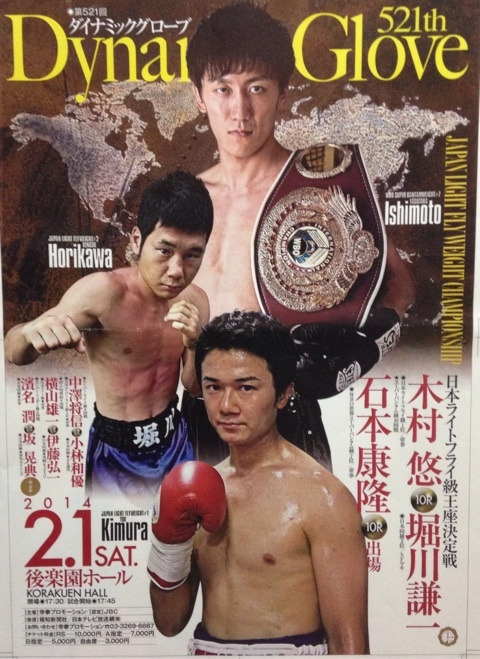 On February 1st title action returns to Japan for the second Japanese title fight of 2014. The fight, part of the "Dynamic Glove" series of shows, sees Yu Kimura fighting Kenichi Horikawa for the vacant Japanese Light Flyweight title. The fight, a pretty interesting one on paper, headlines a decent looking 7 fight show which features Yasutaka Ishimoto in the co-feature. As well as the title fight and Ishimoto's bout there is also a very exciting looking contest between Yuichi Yokoyama and Koichi Ito, both of whom are big punchers. In regards to the poster it's a decent enough one. The 3 key fighters are visible, the date and ticket prices are clearly there for people to see. All in all an effective poster for what looks to be a very decent domestic level card.